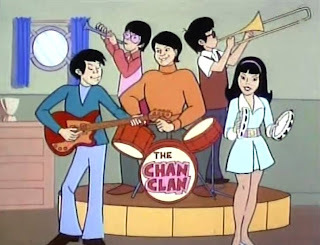 As we continue our look at cartoon characters that sing, we've gotta chat about “The Amazing Chan and the Chan Clan," which ran for 16 episodes in 1972. These guys worked twice as hard as the average cartoon family -- the 10 kids played in a band AND solved mysteries. Oh, and they had a van that could turn into any kind of vehicle, and a dog (Chu Chu) that could make sound effects, Michael-Winslow-from-"Police Academy" style. As kids of a legendary detective tend to be, the Chan Clan were better at fighting crime than they were laying down sweet grooves -- one kid played a trombone. This band actually did have some cred, though -- lead vocals were by the same guy who led The Archies, and music was supervised by Don Kirshner, the uber-producer who died earlier this week. I always thought it was weird that in almost every Saturday morning cartoon in the early '70s, the characters also doubled as a rock group, a la the Archies. There was always a girl playing a tambourine (and it was *always* a girl), and usually there was a dog in the mix. Their song was always tacked on to the end of the episode, in a way that made it seem like a time-killer.